Since I live so close to Oxford I thought it could be worth a trip to the Covered Market to see what stuff I could pick up. One place I'm looking forward to visiting is Palm's delicatessen, they seem to have quite a bit of specialty products. That shop will probably be bad for my wallet. Haymans Fisheries is also high on the list, it's been a long time since I cooked my fish tacos. It might be time for another batch soon. I'm in the market for some rabbit/hare so I'll see what the butchers might have in stock. As always when I'm in Oxford I know that I'll end up in Border's - stocking up on food magazines I can't get in the local shops here. What a gorgeous market!! can't wait to hear about what you found to cook there! I'll be tuning in...I can't wait to see what you come up with! 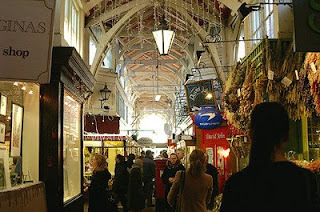 It's a really nice market, it had been ages since last time I went but that will change now. I also like going to Oxford due to the reason that Border's stock lots of American food magazines that I can't get hold of in smaller newsagents.